Laysan Albatrosses (Phoebastria immutabilis) breed primarily in the Hawaiian Islands, but they inhabit Alaskan waters during the summer months to feed. They are the most abundant of the three albatross species that visit Alaska. The Latin family name for albatrosses is Diomedeidae, which comes from the name of the Greek hero of the Trojan War, Diomedes. The Greek gods exiled Diomedes to an isolated island and turned all of his companions into large, white birds resembling swans. The albatross has been described as the "true nomad of the oceans." Since the first humans encountered albatrosses at sea, they have marveled at their mastery of the ocean despite the harshest North Pacific storms. They travel great distances in search of food by riding currents of air that flow just above the surface of the water. With their long, narrow, pointed wings stiffly outstretched they soar effortlessly up and over the peaks of the highest waves only to plunge gracefully into the next valley, all with only the twist of the tail or tilt of the head, and only the occasional wingbeat. It may not flap its wings for hours, or even for days. The aerial master never touches land outside the breeding season, but it does rest on the water to feed and sleep. To avoid predators such as whales and sharks, this bird can even sleep while flying. Once fledged, the albatross remains at sea for three to five years before returning to the island where it was born. When birds are eight or nine years old they begin to breed. The breeding season is November to July and the rest of the year, the birds remain at sea. When albatross return to their breeding colonies, they are not quite as graceful. They approach the island at high speed, pulling up only at the last moment, often times skidding to a stop on their chests. These "crash" landings combined with their strange and elaborate courtship dances, and their lack of fear of people has resulted in them being called "gooney birds" and aho-dori or "fool birds" in Japanese. Anyone who has closely observed these majestic birds on land or watched them at sea, knows how unfair these names are. The Laysan Albatross is a large bird with a wingspan of six feet or more and weighs up to 22 pounds, but that is small for an albatross. The birds' underparts are white and the back and upperwings are uniformly dark. Similar species found in Alaskan waters are the Black-footed Albatross (Phoebastria nigripes) and the much rarer, endangered, Short-tailed Albatross (Phoebastria albatrus). Hybridizations have been recorded between Laysan and Black-footed Albatrosses. The latter may be distinguished by a uniformly dark brown plumage. The Short-tailed Albatross has all white underwings and back, a yellow wash on the back of the neck, and a larger, heavier bill. Albatross pair during their courtship dance. Laysan Albatrosses live from forty to sixty years and are capable of breeding annually. The birds are monogamous and the pair bond is established by an elaborate courtship "dance." Once mated, the bond is only broken by death or disappearance of the mate. They rendezvous each year with their partner at the same location and establish a new nest within a few feet of the original nest site. 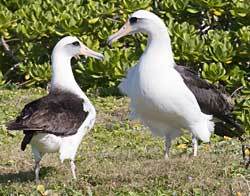 In the U.S., Laysan Albatross nesting is limited to islands in the Hawaiian Archipelago. Colonies also exist on the Bonin Islands in Japan and on Guadalupe Island off the coast of Baja California. 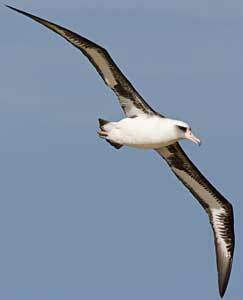 Between July and November, Laysan Albatrosses disperse widely throughout the North Pacific Ocean and adjoining seas. In Alaska, they are most commonly seen in the southern Bering Sea, Aleutian Islands, and the northwestern Gulf of Alaska. Nonbreeders may remain in Alaska throughout the year and breeding birds are known to travel from Hawaii to Alaska in search of food for their young. Albatrosses have the ability to concentrate the food they catch and store it in their bellies for the long flight back to their chicks in Hawaii. When the parents arrive back at the nest, they feed the chick by regurgitation. This species eats mostly fish, fish eggs, and squid often feeding at night when the prey rises to the surface. They also feed on fish waste disposed of by fishing vessels. Feather hunting and military developments decimated colonies on some islands earlier this century, but are no longer a threat to the Laysan Albatross. However, the species continues to encounter human caused mortality from a variety of causes. In 1990, an estimated 17,500 Laysan Albatrosses were killed in high seas driftnets (0.7% of the population). A ban on this fishery in 1993 substantially reduced overall bycatch in the U.S. fisheries. Laysan Albatrosses are also killed as bycatch in longline fisheries. During the 1990s, thousands of Laysan Albatrosses were killed each year in Hawaiian longline fisheries. In Alaskan waters, an estimated 413-508 Laysan Albatrosses were killed per year in the Bering Sea/Aleutian islands demersal groundfish longline fisheries and an estimated 81-127 were killed annually in the Gulf of Alaska. Most of the bycatch occured in the longline fisheries, but the trawl groundfish fishery has occasionally shown relatively high bycatch levels. In the Gulf of Alaska, Bering Sea, and Aleutian Islands combined trawl fisheries, 186-253 Laysan Albatrosses were killed annually between 1998-2003. Alaska and Hawaii represent only a portion of the incidental fishing mortality that occurs in the North Pacific. Bycatch in fisheries conducted in the North Pacific by Japan, Taiwan, Korea, Russia, and China is also a concern. Collisions with airplanes threaten albatrosses and are a serious threat to humans as well. Between 1954 and 1964, 54,000 birds were killed at Midway Island to reduce the risk of collisions with military aircraft. This problem has diminished in some areas, but continues to remain a problem at the Pacific Missile Range (Kauai), Dillingham Airfield (Oahu) and the Marine Corps Base Hawaii (Oahu). Nesting efforts are thwarted in these areas by egg collection and relocation of adults. Predation by dogs, cats, and rats (Rattus spp.) is still a threat on some Hawaiian Islands. Rats have been eradicated on all Northwestern Hawaiian Islands, but some large islands still have rats. Tiger sharks (Galeocerdo cuvier) are also an important predator of albatross chicks. On Midway Island, nearly 10% of the fledglings fall prey to tiger sharks in the waters surrounding the island. A serious conservation concern is plastics ingestion. If nestlings are fed plastics that parents find at sea (often entangled with food), their food and water intake is reduced. This can potentially cause dehydration, starvation and death of the chicks.